New BT Home Hub 4 wireless router is to be released on 10th May, it has been revealed. BT has been trialing the device early this year before the launch. 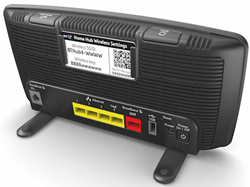 BT broadband customers are currently being offered Home Hub 3 wireless router which comes free with its contract deals. Comparing to BT Home Hub 3, the Hub 4 will have some similar features like smart dual-band technology, which avoids interference and enhances performance while working in wireless environment. “BT’s the first major ISP in the UK to offer such innovative smart dual-band technology” said John Petter, Managing Director of Consumer Division at BT. BT Home Hub 4 is capable of offering maximum speeds of up to 500Mbps at 2.4GHz frequency and up to 500Mbps at 5GHz frequency. Smart wireless is advanced technology used by this wireless router to pick the best signal at these frequencies. Home Hub 4 will work with both standard,ADSL 2+ broadband and superfast fibre optic broadband. Four Lan ports are available for ADSL 2+ sharing while only one 1 Gigabit connection is available for BT Infinity users. Wireless routers use encryption of data for secured transmission of data wirelessly. Hub 4 also uses standards like WPA, WPA2 and WEP for encrypting data. As per details from BT, new customers who sign up to unlimited and Infinity broadband deals will get the new Hub 4 free of cost. Existing customers can get this device free on certain conditions. The device generally costs £35.